The 2nd Harewood 10 mile Trail Race and 3rd Harewood Hop 2 mile Fun Run took place on Sunday 30 September 2001. In the 2-mile 'Hop' Eleanor Kitchen was 9th overall, and won the G11-12 class in 14.13, with Simon and Bradley Chapman running too with times of 17.30 and 26.39. 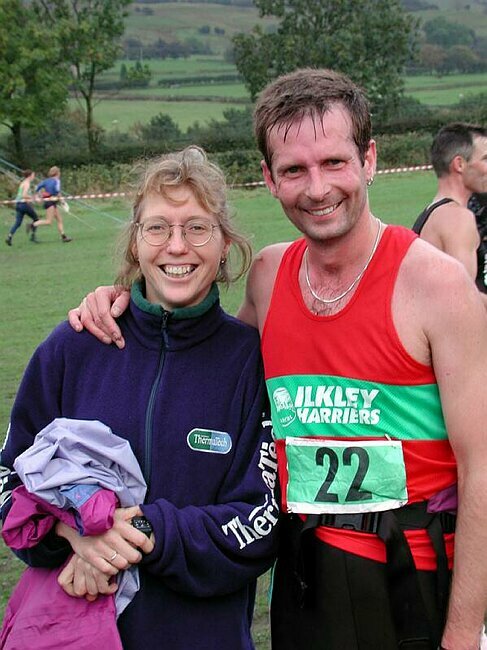 Ilkley Harriers compete in all sorts of events, and Eddie Winslow has just completed a succesful season of 'Ace Races' - adventure races with canoeing, night orienteering, mountain biking, and running, all in one event. At the last event, on Cannock Chase, Eddie was 2nd overall, which with earlier good results gave him 3rd place in the series. Like it? Hate it? Don't care? Over at the Manchester Marathon, Andy Wade ran a PB (by 1m54s) of 2h56.29 for 70th place in a field of 1500. John Taylor, a second-claim Ilkley Harrier, was second to fellow Bingley runner Ian Holmes in Sunday's race over 7 miles and 2,000' of climb. Nick Pearce was 34th in 56.30; Mike Baldwin 45th in 58m, with Geoff Howard 50th in 58.30, then Adrian Hall 60.49, Pete Shields 64m, and second-claim member Kirstin Bailey just a few places behind. 9 Harriers were in the 230-strong field at Leeds and Bradford Triathlon Club's Ilkley Triathlon last weekend. The event, in its 9th year, was won by Martin Shaw of the Triangle Asics club in 55.45 minutes. The fastest Harrier was Jim Ryder in 20th place with a total time of 63.31 (9.15 for the 500m swim in Ilkley Pool; 33.15 for the 9 mile bike ride (3 circuits of Carters Lane and Curly Hill); and 21.01 for the 3 mile run). Second-claim Harrier Angela Srivastava was second lady, 65th overall in 72.42 (11.41/40.09/20.52). Next was Di Kitchen, whose overall time of 74.38 (12.02/38.40/23.56) was good for 84th overall, and prizes as first local lady and 3rd lady Vet. Neil Chapman was 101st in 76.56 (13.53/41.14/21.49); Caroline Howard 106th in 77.55 (11.41/42.32/23.42); Susie Jollie 164th in 85.05 (10.40/46.10/28.15); Eric Philipson 165th in 85.06 (19.35/40.30/25.01); Janet Hebbert 173rd in 86.16 (12.50/46.38/26.48); Shirley Wood 180th in 88.37 (13.22/47.56/27.19). finishing off with a hilly 3 mile run! There is no rest for the athletes until the run is finished. The start list of 270 includes several Ilkley Harriers, a number of "triathlon virgins" as well as seasoned athletes looking to go round in under an hour. Only four competitors managed this feat last year. The race limit of 270 was reached over 7 weeks ago. Race Director David Robinson said he could have filled the race twice over and has had to turn away hundreds of entries. Many athletes have traveled over 200 miles to race and will be making their trip to Ilkley a full weekend experience. Also benefiting from the influx of athletes and their supporters will be the many Ilkley businesses playing host to athletes and their families. The race would not go ahead without a dedicated team of over 40 marshals. As ever extra help on the day is always appreciated. If you can help for an hour or so please telephone the Race Director David Robinson on 0113 250 7158. If you can't help out don't forget to come down and watch the race. The first athlete starts their swim at 12.30. Prize giving will start as soon as the last competitor finishes the race. A reminder that the AGM is at 8pm at Ilkley Tennis Club. Further details and agenda in the August newsletter. All Harriers welcome. With the loss of daylight, Pete's Thursday night training will have to come down off the fells. From this Thursday it will be based at Ilkley Tennis Club, 7pm. Andrea Priestley was 26th lady in 1h21.50 (I'd seen what looked like an Ilkley vest in the Ladies' Elite Start, but thought "no, can't be ..."). Fantastic. Next Harrier was Mark Iley 297th in 1h23.41; then Kevin McMullan 630th in 1h28.21; Suzanne Akeroyd 1h42; Keith Wood 1h42.45; Richard Midgley 1h43; Jill Cooke 1h48; Julie Harvey 1h48; Margot Dale (time tbc); Steve Fletcher 1h59; Chris Airey 1h59; Vince Gibbons 1h59; Bernie Davidson 2h01; Susan Kennedy 2h01; Bernie Gibbons 2h06; Amanda Parnaby 2h09; Heather Duke 2h13. Tracey Ambler was 37th, and second runner for England, in the World Mountain Running Trophy at Arta Terme, Italy, on Saturday, running 44.52 for the 8.5km course. In the men's race over 13km, Bingley's John Taylor, a second-claim Harrier, was 30th in 1h06.51. Peter Shields, coach to many Ilkley Harriers and other athletes, has been appointed as the Mountain Running Coach for England, by the Fell Running Association. His remit is to develop fell running amongst English endurance athletes. Responsibilities will include coaching at the top level, liaison with other coaches and athletes, attending international events, assisting team managers, and organising events like performance weekends. Congratulations and best wishes to Pete in this from all the Harriers. Nick Pearce was 10th in 56 minutes in the 9 mile Barnsley Trail race on Sunday. Update 10 Sep Tracey Ambler has been selected to run at the World Fell Champs after this fine result. A reminder that from Tuesday 4 September we will be running from Ilkley Tennis Club. Remember to bring your membership card. Suzanne Akeroyd and Richard Midgley both competed in last weekend's Two Bridges Race, a 35 mile Ultra Marathon from Dunfermline to Rosyth. 114 runners started the race, in its 34th running, but only 88 finished within the 6 1/2 hour cut-off time. Both our runners were succesful: Suzanne was 51st and 3rd lady in 5h11m, and Richard ran 5h23m. The 15th Annual General Meeting of Ilkley Harriers Running Club is on Wednesday 26th September at 8pm at Ilkley Lawn Tennis and Squash Club. All members are encouraged to attend. A revised Club constitution will be presented to the meeting for approval. Anyone wanting advance sight of the document should contact Peter Cooke. Please forward nominations for Committee positions, and motions for consideration to either Geoff Howard or Peter as soon as possible. Circuit Training sessions will recommence on Monday 3rd September. All details are as before: meet at Ilkley Grammar School, 6.30 (prompt!) - 7.30pm. £1 per session. Payment for the whole block is always easier (cheques payable to Ilkley Harriers) and any credit at the end of the term will be carried forward to the next term. There are 11 sessions in the ‘Autumn term’: as before we cannot use the gym on the second Monday of each month so dates are: September 3rd 17th, 24th; October 1st 15th 29th; November 5th 19th 26th; December	3rd 17th. Two Harriers were in the first three at the quality Grasmere fell race last weekend - one of the oldest races in the Lakes. Helen Sedgwick had a fantastic run to finish 2nd lady in 19.00, with Bingley's Kirstin Bailey (a second-claim member of Harriers) just one second behind in third place. Meanwhile, Margot Dale, preparing for the Great North Run like many Harriers, ran 2h05 in a half-marathon in Glasgow. Another good run from Mark Iley, in 18.18 for 20th (not 18th?) place. Some of the orienteers in Ilkley Harriers competed in this international orienteering event - 6 races over superb Scottish terrain. Best results were from Shirley Wood and Tony Thornley - 3rd overall in their respective classes. Paul Wood was 10th in his class, and Joyce Marshall 12th in hers. As of next Thursday, 9 August, Thursday night training will be on Ilkley Moor. Meet opposite Darwin Gardens for a run starting at 7pm. Keith Wood will lead training on Thursday 9th, then Pete will be back from 16th August. Fallback: we've acted quickly to make the most of this, but who knows what fate/DEFRA/Bradford will bring next? So if access to Ilkley Moor is lost again we will revert to using Danefield. Ilkley Moor is open again!! Hurrah! And the old clubhouse at Ben Rhydding will soon be demolished (Hurrah again!). Fallback: we've acted quickly to make the most of this, but if fate/DEFRA/Bradford intervenes and access to Ilkley Moor is lost again we will revert to running from BRSC car park until September. The International Snowdon Race is a 10 mile fell race, racing up and down the 3250' from Llanberis to the summit, with the international standard athletes taking well over the hour for the demanding course. There were three Ilkley Harriers running: Nick Pearce was fastest in 1h31m, after a brave descent with badly blistered feet. Mike Baldwin was next in 1h36, and Vet-50 runner Dennis Ackroyd also ran well. Second-claim Harrier John Taylor (Bingley) was the first Brit home, in 3rd place - an inspiring result. Former Harriers Malcom Pickering, Bob Hamilton (Wharfedale), and Jason Hemsley (Pudsey) all enjoyed good results too. Due to the F&M situation it hasn't been possible to select the normal range of events for 2001, so the competition has been suspended. However to make the Harrogate League more interesting, a Handicap competition similar to the Harriers Running League has been held. The five races of the Harrogate League were used with an individual’s best three scores to count. As with the Harriers League the points have been calculated with reference to tables which allow performances to be age related for both male and female runners. If the Ilkley Harriers Running League can be resurrected later in the season, these scores from the Harrogate races will be carried forward. The current series of Monday circuit training sessions finished tonight. Thanks to Pete for all his hard work, and working us so hard. A new series will start in September, with Pete promising even more fun - don't lose too much fitness before then! Ripon Runners laid on a great 7km multi-terrain course for the finale of the Harrogate Road League, a handicap race with handicaps based on individuals' performances in the league. Four Harriers ran well enough to beat the handicapper and finish in the first 20: Alex Hirst was 6th in 31.04; Cath Wolfenden 12th in 30.36; Mandy Parnaby 15th with 36.24; and Alison Crane 18th in 31.55. Tony Thornley was 31st; Brian Sweet 33rd in 37.46; Phil Hirst 37th; Bob Whiting 58th; Di Kitchen 73rd in 31.28; Emma Barclay 93rd in 29.24; Bridget Doherty 99th in 33.25; and Mark Iley in an unaccustomed 110th place in 26.02 - handicap races are always difficult for the faster runners. After the usual splendid tea, the prizes for the league were presented. The Ilkley Ladies team collected their shield, and Dave Matthews was awarded the trophy for best Vet-50. Just outside the prizes, but worthy of mention, were our second place in the Lady Vets' competition (watch out Harrogate - we want that trophy next year! ), 3rd in the Male Vets' competition , and 5th in the main team competition. Most Harriers will now know the outcome of the vote on whether to stay at Ben Rhydding Sports Club or to move to Ilkley Lawn Tennis and Squash Club: a large majority voted to move to the Tennis Club. The Ilkley Harriers committee are now working hard to do all that's necessary for the move, which will be at the start of September. Ken's Thursday sessions, training on the grass at BRSC, have now finished. Pete himself will be away for the next few weeks, but the sessions will continue! Lost item replaced 28 Sep.
Four Harriers took part in the inaugural Tesco Great North Women’s Run in aid of the Imperial Cancer Research Fund on Sunday 8 July. The five-mile course over two laps of streets in Manchester City Centre took in the cobbles of the Coronation Street set at Granada Studios. [No. There wasn’t time for a pint in The Rovers’ Return.] A distinct lack of soap stars was noted but when Margot Dale (209th 42.30), Bernie Gibbons (334th 44.39), Jane Coupe (479th 46.41), and Heather Duke (486th 46.44) are taking part, who needs any more glamour? The Manchester climate lived up to its reputation as the entire race took place in steady drizzle. Hundreds queued for the loos at Manchester Town Hall but our Yorkshire Lasses were smart enough to use the men’s. More than 2,000 runners turned out for the first of what is planned to be an annual event. This was a good humoured, well-organised morning with easy access and parking. Recommended.